After today the podcast will be on a 2-3 week hiatus. I will talk to you all in August! Today I talk a lot about socks, a little cross stitch, and a few things I bought online. ♥ Sock it to Summer is ongoing through 31 August, 2014. Please be sure to enter those finished pairs of socks in the group! We’re about to round the 50 finished pairs mark! ♥ The podcast will be on hiatus for 2-3 weeks while I go back home to collect my children. Shows will resume their weekly schedule starting in September. Today I talk about some finished socks, another pair of socks on the needles, some cross-stitch, and a little enabling thanks to my birthday this last Sunday! Remember, kittens: Sock it to Summer is still on going through 31 August. Please join the Ravelry group and enter those finished pairs! ♥ You still have a little over a month to join Sock it to Summer if you haven’t already: go check out the Ravelry group for details. ♥ There is an active coupon code for the Pumpkins through Noon PST on 29 July! Type in “BIRTHDAY” at check out to get 26% off your order! ♥ MoonRover July 2014 Club colorway plus some mini skeins to match my Momijigari sock yarn! ♥ Manos Del Uruguay Allegria “Bataclana” – I checked and that is the correct name for the colorway…and it also means “Stripper.” So now we know. I’m back from the first part of my vacation with a little bit of craftiness to share with you all! I have finished socks, a couple of dresses, cross stitch, and a few pretties to share. The timing of my first vacation this summer could not have been more inconvenient in terms of blog posts: I missed not only my monthly yardage tally, but also my quarterly Stashdown post at the end of June. I’m only just now feeling ready to play catch up and talk about my results for the quarter. Second and third quarter of the year are always rough for me; it’s when the weather starts to heat up, and I simultaneously stop knitting and start purchasing more yarn. Because buying more yarn will magically make me forget how disgustingly hot it is outside and inspire me to work at twice my usual pace. Or something. 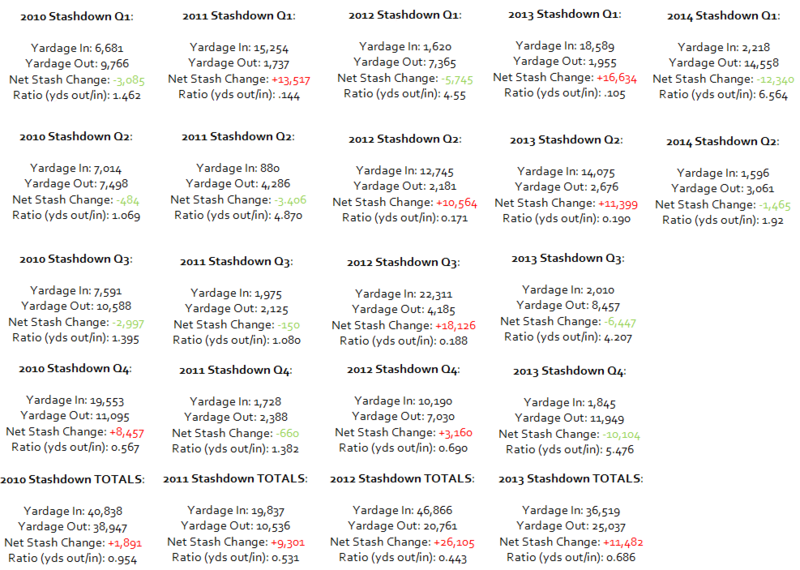 My numbers for Q2 are modest, but a step in the right direction. I managed to use/destash almost twice as much yarn as I brought in. And honestly, had one of my Indies not closed shop and a skein of another Indie I’ve been searching for gone up for sale, my amount in would have been much lower. I’m still chuffed with the result. I’ve made it halfway through 2014, and I’m still very much in the green. I’m hoping I can keep the momentum up through the end of the year and have my first ever year of actual stash reduction. I’m still not counting hand spun yarn as stash out or in as of yet, so that has some impact on my stash size; these are just my numbers for commercial and hand dyed yarns. I think 2015 will be the first year that I count hand spun in with my numbers. I suspect that will be…enlightening. But yardage tracking always is. Here’s to another quarter in the green! Time for Q3.